More complete and concentrated than any other food source of calcium. Suggested Use: 6 tablets per day. Bone Nourisher® Supreme is the ultimate calcium formula. It features Foodform lactobacillus-cultured minerals. Lactobacillus is a friendly bacteria, used to make yogurt. This is the next generation of Foodform minerals providing almost triple the amount of whole food calcium and magnesium. Six Bone Nourisher Supreme tablets give you 645 mg of calcium, 313 mg of magnesium, plus 14 other Foodform nutrients and Vitamin K2 as MK-7, all of which are important for bone health. 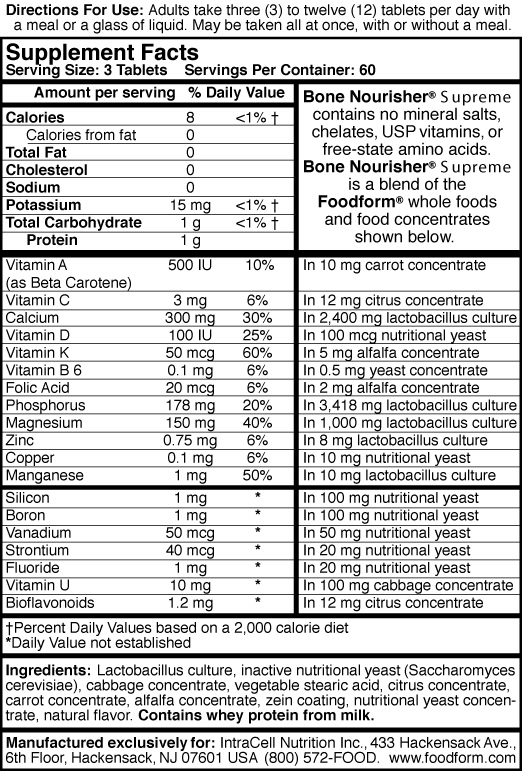 Bone Nourisher Supreme is more complete and more concentrated than any other food source we know of. It is absolutely the world's best. Unlike ordinary vitamins and minerals, Bone Nourisher Supreme contains no mineral salts, no chelates, no free-state amino acids. Bone Nourisher Supreme nourishes your bones and teeth because it contains whole foods and whole food concentrates. Bone Nourisher Supreme is rich in every vitamin and mineral you need for strong, healthy bones and teeth. Foodform ingredients have been tested by independent researchers in more than 60 university studies which show they are better than regular (USP) vitamins and mineral salts. Bone Nourisher Supreme is so naturally-acceptable to your body you can take it all at once, whenever it is convenient. There’s no upset stomach. You would have to eat a huge volume of food to get the nutrition of just 6 tablets of Bone Nourisher Supreme. Yet it contains only 4 calories per tablet. Slow-speed tableting process minimizes the need for excipients (inactive ingredients). Using high speed machines would be cheaper, but we don't want to compromise the purity of this natural product. By the way, my last bone density test showed an improvement! I rely on this for my health, especially for osteoporosis. and The Mother of All Antioxidants® are trademarks of IntraCell Nutrition Inc.